KNOXVILLE, Tenn. (Dec. 13, 2018) — Unsurpassed service, incomparable business operations, and unwavering professionalism are just three of the many qualifications Sea Ray dealers, the most awarded dealer network in the country, must achieve to be named a Top 100 Dealer by Boating Industry. Sea Ray is honored to announce that 14 dealers were recognized in the prestigious lineup with Austin, Texas based Sail & Ski Center taking the top spot. 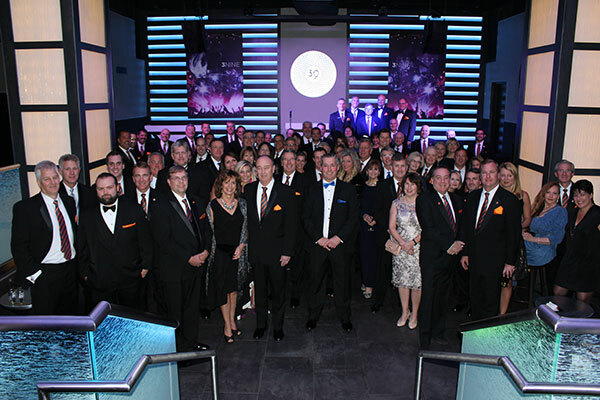 MarineMax and Prince William Marine Sales were also acknowledged as Boating Industry Top 100 Hall of Fame members in attendance at the event. Honored with the coveted #1 Top Dealer title was Austin, Texas based Sail & Ski Center, who is mourning the recent loss of legendary Co-Founder, industry pioneer and true Sea Ray partner, Rod Malone. “I’m personally grateful to have had the opportunity to work with him and learn from him,” Anderson said. “He was instrumental in growing Austin and San Antonio as top Sea Ray markets, and we can’t forget the Sail & Ski partnership with one of Sea Ray’s most famed events, Aquapalooza, hosted on Lake Travis.” Anderson said that after a 31-year relationship with Sea Ray, Malone is dearly missed, and his legacy lives on with a dedicated team of individuals he inspired within the Sail & Ski organization. To find award-winning Sea Ray dealers in your area, and to view the complete lineup of award-winning models, please visit searay.com. Headquartered in Knoxville, Tenn. Sea Ray is the world’s leading creator of superior quality pleasure boats. For nearly 60 years, Sea Ray has pushed the limits of performance and craftsmanship to elevate the boating experience. Each Sea Ray is designed to make every moment exceptional; supporting boaters’ unique lifestyles with a customized balance of unparalleled comfort and performance and world-class technology throughout. Learn more about the Sea Ray Experience at searay.com. Headquartered in Mettawa, Ill., Brunswick Corporation’s leading consumer brands include Mercury Marine outboard engines; Mercury MerCruiser sterndrive and inboard packages; Mercury global parts and accessories including propellers, and SmartCraft electronics; Power Products Integrated Solutions; MotorGuide trolling motors; Attwood, Garelick and Whale marine parts; Land ’N’ Sea, BLA, Payne’s Marine, Kellogg Marine & Lankhorst Taselaar marine parts distribution; and Mercury and Quicksilver parts and oils; Bayliner, Boston Whaler, Brunswick Commercial and Government Products, Crestliner, Cypress Cay, Harris, Lowe, Lund, Princecraft, Quicksilver, Rayglass, Sea Ray, Thunder Jet and Uttern boats; Life Fitness, Hammer Strength, Cybex, Indoor Cycling Group and SCIFIT fitness equipment; and Brunswick billiards tables, accessories and game room furniture. For more information, visit https://www2.searay.com/e/47872/2018-12-13/79hzgj/378654141?h=1URi--Dz4JiopXeiq5Rk6nw5LtQQ_N7ppTymysrphCQ.